When Pope John Paul II died, Suzanne Strempek Shea, who had not been an active member of a church community for some years, recognized in his mourners a faith-filled passion that she longed to recapture in her own life. 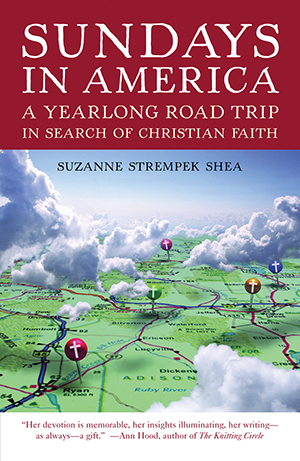 So she set out on a pilgrimage to visit a different church every Sunday for one year-a journey that would take her through the broad spectrum of contemporary Protestant Christianity practiced in this country. From a rousing Easter Baptist service in Harlem, to Colorado’s Pro Rodeo Hall of Fame for a sing-along at the Cowboy Church; from a roofless Episcopal church in Hawaii, to a storefront African orthodox church where jazz legend John Coltrane is considered a bona fide saint; from the largest church in the country to a small-town church packed for a Sunday school class taught by Jimmy Carter, Shea toured more than thirty states in search of the meaning of Christian faith to the many who practice it. The result, Sundays in America, is an essential guide for those seeking a new house for their worship as well as a colorful road trip for the armchair explorer.